Before I even arrived here, there was one thing that came up in every conversation about BDF. The food. Everyone gushed to me how good the food is at the festival. The wall of cereals, the vegan station, wood-fire grilled gluten free pizza and 9 different types of milk. Tofu, tempeh, enchiladas, make-it-yourself waffles, gluten free bread, almond butter and a plentiful salad bar. I won’t even tell you how many trips I’ve made to the soft serve ice cream machine. A few weeks ago I saw a post on Doug Varone and Dancer’s Facebook page, “Day one at Bates. Looking forward to class, rehearsal…and the food!” It really is that legendary. Breakfast, lunch and dinner at the Commons! 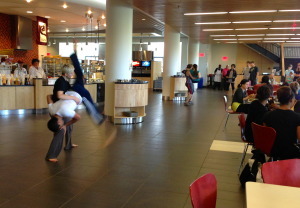 However, I would argue the best part of the Commons really is the atmosphere the dancers bring to the space. In some ways it is the center of the festival. The Commons is our place to catch up with friends and see how their day is going or find out when rehearsal begins that afternoon. Virtually everyone at the Festival eats their meals at the Commons. So you will inevitably find yourself standing next to Bebe Miller at the salad bar or making your coffee with one of the Varone dancers. I’ve had the opportunity to eat lunch with my instructors, the director and complete strangers. I’m aware that this is not a new concept, that food brings people together. But it is worth noting. Very rarely do we have the space or time to talk, reflect and even just joke around with our friends and colleagues. And three times a day at that! Commons is not just our place to eat meals but also our place to reflect and connect. We even dance in the Commons! Bridgman and Packer’s modern repertory class surprised us today with a performance during lunch.